Generate and send numerous triggered emails based on customer activity to build productive relationships with clients and increase the number of repeated purchases. Customize email templates and effectively manage emails dispatch. Experienced merchants know that a wisely built follow up email strategy is one of the most effective tools when it comes to customer retention. Due to highly targeted reminders timely sent to clients you'll easily return customers to your store, increase their loyalty and boost sales. With the Follow Up Email extension one can create numerous custom email templates based on previous orders, wishlists, newsletter subscriptions, customer birthdays and many other events. Use flexible rules to inform customers about hot deals, automatically attach discount coupons and send birthday greetings. Schedule automatic emails dispatch according to your needs and get detailed statistics via Google Analytics. Be extremely helpful to your clients by sending them follow ups based on products they've already purchased. You can easily generate and send emails suggesting up-selling, related or cross-selling items. Let your customers know when their group is changed. For example, you can inform clients that they have been recently 'moved' to the 'VIP customers' group and from now on they are provided with a 10% discount on any products in your store. Send a welcome message with special discounts to newly-subscribed customers. Motivate them to return to your online store by providing special offers available only for subscribers. To return potential customers who haven't logged in to your store for a certain time period send them winback emails with exclusive offers. Due to timely sent reminders with tempting deals you'll increase the number of repeated purchases. Provide customers with special presents and discounts in birthday greeting emails. Create nice-looking greeting card templates with attached coupons to show your attention to each client and build customer loyalty. +NEW: Define in what time period customers will receive a greeting email: specify the number of days before the actual birthday's date and congratulate your clients in advance. With the Magento 2 follow-up module you can create flexible rules for each event type to meet your business goals. 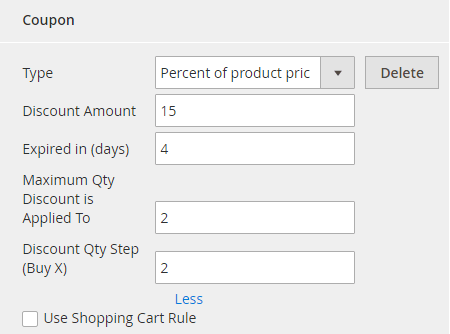 Set conditions for a store name, product SKUs, category and type, cart subtotal, the number of orders etc. With the advanced Magento 2 follow up email tool you can automatically generate and send any number of triggered emails, thus saving your time on other store management activities. Flexible settings enable you to plan follow up email campaigns in advance and carefully schedule letter dispatch according to your requirements. E.g. use the 'Date' starting event to run a campaign dedicated to a specific holiday. It's also possible to make the coupon available only to the email recipient. The Follow Up Email Magento 2 extension offers a list of predefined email templates based on orders, wishlists and customer activity. Use themed email templates to create special notifications for particular events. You can easily edit any of the templates according to your specific needs changing their content and CSS. Use format manager to show currency, dates, price and time in the necessary format. Use URL manager to automatically generate URLs corresponding to Magento requirements. Use any of the available product list designs according to your taste. To prevent sending emails to unwanted or unsubscribed customers you can add their email addresses to a black list. This way you'll keep your email database clean and up-to-date and avoid being added to spam. To make sure that everything works correctly always preview templates and send test emails to the specified email address. Manage all cron tasks on a Cron Tasks List grid. Nice extension to keep your customers engaged. You can feed your clients' interest communicating with them with the thematic messages, based on their tastes and wishes. Sometimes it is necessary to have one for a web store. – Fix: the issue with sending test emails on PHP 7.1. was fixed. – The issue when multiple emails were scheduled for the same action instead of one was fixed.